Using Design Manager, Is it possible to filter the Content Query web part using the Wiki Categories? For example, if the current wiki page has a category of InfoPath, the Content Query web part should list all pages with the same category? Below is my attempt but I keep getting an error message Cannot save all of the property settings for this Web Part. One or more errors have occurred. See below for details. As the post suggested, the original List GUID was different from the actual Pages library GUID. To bypass the error message from the Design Manager Content Query UI, I just typed any text in the filter value and replaced it with [PageFieldValue:column name]. 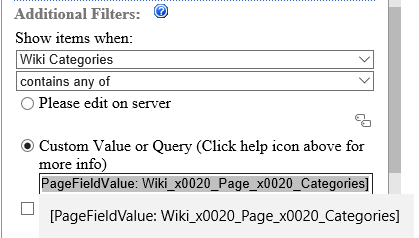 In my test, the [PageFieldValue:Wiki Categories] can be applied and it works as expected. Type the display name of the site or list column, not the internal name, compare the results. Not the answer you're looking for? Browse other questions tagged sharepoint-online content-query-web-part design-manager or ask your own question. How can i use PageFieldValue as a parameter in Content Query WebPart 2010?